The stately mansion into which Britomart and the rescued Knight now entered was called "Castle Joyous," and the owner of it was known to her retainers by the name of "the Lady of Delight." It would be impossible to tell all the wonderful richness and beauty of this building, which was adorned fit for the palace of a prince. Passing through a lofty and spacious chamber, every pillar of which was pure gold, set with pearls and precious stones, the knights came to an inner room, hung with the most costly tapestry. The place was filled with the sweetest music and the singing of birds, but the wasteful luxury they saw on every side did not please Britomart nor the Knight, and they looked with a scornful eye on such lavish profusion. Then they came into the presence of the Lady of the Castle. They found her seated on a splendid couch, glittering with gold and embroidery. She seemed very generous and of rare beauty, but she was neither gentle nor modest, and she never hesitated to gratify her own desires at any cost. When she saw Britomart, who, in her armour, appeared to be a young and handsome knight, she took a great liking to her, and thought how nice it would be if she would enter into her service, and stay altogether at the Castle. All through the splendid supper which was presently served, she tried to make herself as agreeable as ever she could, hoping that Britomart would be tempted to remain. After supper, she begged her to lay aside her armour, and enjoy some sport; but this the maiden refused to do, for she wore it as a disguise. Britomart would not be so discourteous as to repulse the kindly spoken offers of goodwill, but she in her heart thought that such a sudden affection for a wandering guest could not be worth very much. When the supper-tables were cleared away, all the knights, and squires, and dames began to make merry. There was dancing and gambling, and every kind of revelry; but through it all Malecasta (which was the real name of the Lady of Delight) was plotting in her own mind how she could get hold of Britomart. 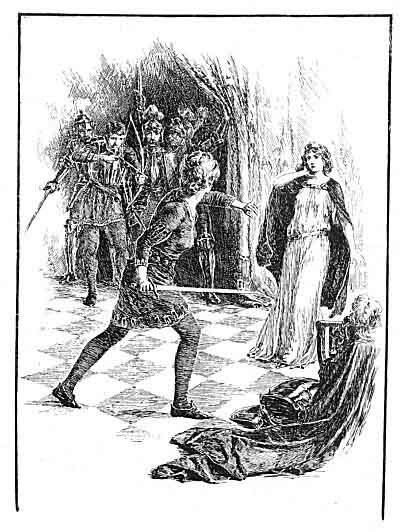 If the gallant young Knight (as she thought him) would not consent to stay of his own free will, she determined to detain him by guile. one of them drew a deadly bow, and shot a keen arrow at her, which wounded her in the side. But the noise had also wakened the other Knight, who now ran to her help, and, fighting together side by side, they soon defeated their foes. When they were all put to shameful flight, Britomart arrayed herself again in her armour, for she would stay no longer in a place where such things were done by those who were apparently noble knights and ladies. Quite early, therefore, while the dawn was still grey, she and her companion-knight took their steeds and went forth upon their journey.